Exclusive and elegant, a few miles from Rome, the Abbey of St. Andrew in Flumine for centuries overlooking the lush valley of the Tiber. The beautiful consecrated church accommodates up to 140 seated people. 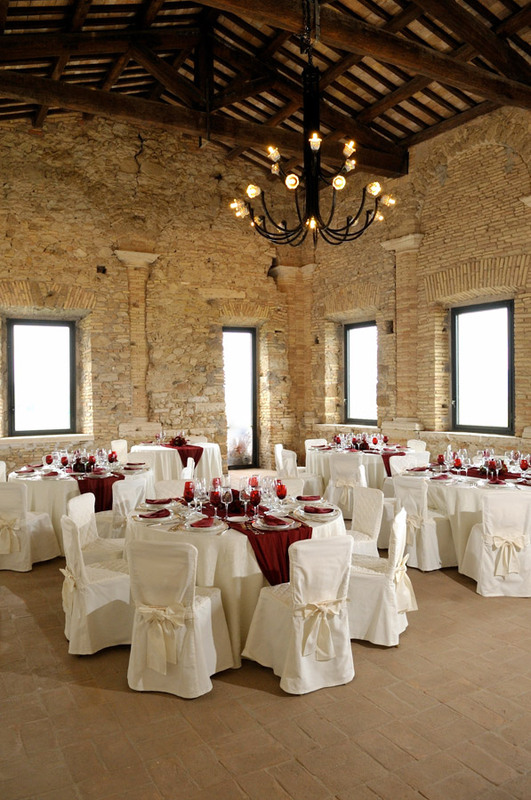 The sober halls for the reception with beautiful views of the Tiber Valley, can accommodate up to 200 guests. In the winter months or in case of rain, we have more interior rooms on the lower level available for the aperitif/appetizer, the dessert buffet and musical entertainment. All rooms are heated. For years the collaboration with banqueting our confidence allows us to offer impeccable service that will delight the most discerning palate offering authenticity, tradition and innovation. Despite the exclusivity and elegance of this beautiful historic home, you’ll find our affordable all inclusive packages: banquet service, exclusive location, interiors and exteriors fittings, parking facilities, cloakroom service, cleaning, torchlight, the presence of management at competitive prices. Finally, all our dedication and professionalism in taking care of the details of a unique and special days. You can avail the services of our affiliated partners. Based on our experience, we will guide you in choosing the services that complement the organization’s wedding: floral arrangements, musical entertainment, photo shoot, children’s entertainment, confectionery, photo booth corner, and more else. The location is also available for baptisms, anniversaries, private parties. To tour the facility and view our proposals, we are available from Tuesday to Sunday by appointment.